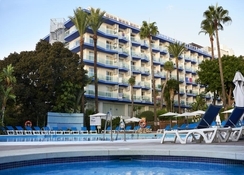 Palmasol Hotel is located right opposite the Puerto Marina in the tourist district of Benalmádena, barely 250m from the beach. Nestled amidst lush and beautiful gardens, the hotel basking in the warm Andalusian sun, offers guests modern amenities such as an outdoor swimming pool and sun terrace. Offering spacious double rooms equipped with satellite TV, telephone, safe deposit box, air conditioning, en-suite bathroom and shower or bathtub, the hotel is a great accommodation choice in the heart of Costa del Sol. 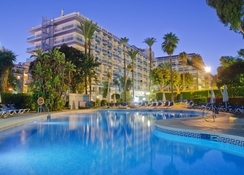 Whether you are visiting Benalmádena for leisure or work, this is the perfect base to explore this wonderful seaside resort and surrounding areas. Benalmadena with its toasty Mediterranean climate that fluctuates between 17-30o C, is an all-weather beach resort. Its beaches range from wide, sandy beaches great for families with small kids to rocky beaches preferred by seasoned swimmers, and are within close proximity to Puerto Marina. Further away at Torremuelle (about 7km), there are quieter and emptier beaches. This area has secluded coves preferred by nudists. 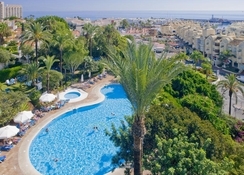 Palmasol Hotel is right opposite the Puerto Marina and just 250m from the beach. A lovely promenade lined by shops, cafés and restaurants connect the coast to the Marina. The distance to Bil Bil Castle is just 1.8km. The Malaga Airport is about 15km from the property. The 269 rooms at Palmasol Hotel come in categories like Double room, Large Double and Junior Suite. 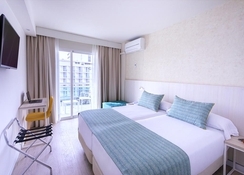 The air conditioned rooms are furnished with two 90cm beds, satellite TV, telephone, safe deposit box, en suite bathroom with shower or bathtub, complimentary toiletries and hair dryer. There are balconies attached with the rooms that offer magnificent views. Wi-Fi is available at a charge and wake-up service and cleaning services are available. The Palmasol Hotel has a buffet restaurant that serves delicious Spanish and international cuisine. The hotel organises lively outdoor barbecues throughout the summer months. There is a bar where guests can retire with a cocktail during the evening. 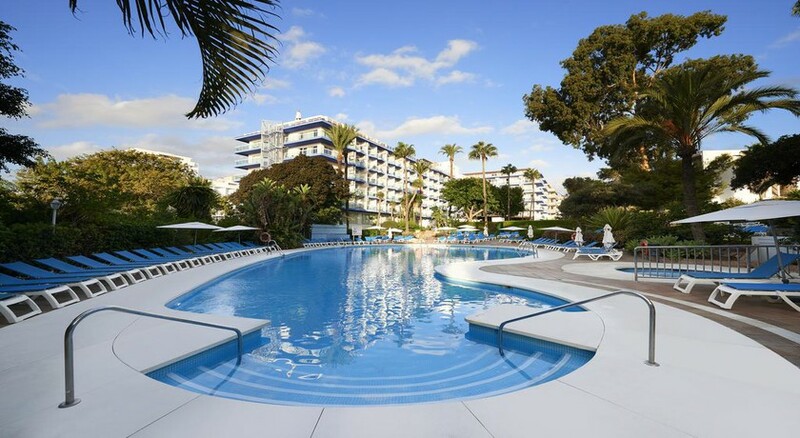 The hotel has a swimming pool equipped with sun chairs and sun umbrellas and a solarium. Massages are available on request and so is a hot tub/Jacuzzi. Those who wish to stay active can work out at the fitness centre. The hotel presents evening entertainment programs. Sports like darts, table tennis and billiards can be played at the indoor play area here. This is a lovely hotel with great swimming pool and plenty of daytime activities,also a gym and spa for all age groups to join in. The rooms were spotlessly clean beds made daily and clean towels every other day. Food was good always lots of choice so there was something for everyone. We watched some great entertainment each night and also a disco for the younger generation to join in as well. Great for families and couples. Had a lovely stay at this hotel. Location very good but view overlooking a building plot not so good although we could see the sea sideways on! We found the food excellent value. The swimming pool and surrounding area was lovely and our party of 4 always found somewhere to sit although we went end of June so not high season. Room was adequate although the only available plug sockets were behind the tv table. Ended up having to use the shaving point in the bathroom to charge one of the phones. Entertainment was basic and everything ended at 11pm! Location was great. Near shops, marina and great beaches nearby. We booked this Hotel last minute but upon our are we were really delighted. Position was perfect for exploring the harbour. Staff were helpful and friendly, pool was clean and well maintained. The food in the restaurant was good with plenty of choice. Our bathroom was clean and modern but the only criticism that I could find is that the rooms could do with a lick of paint and that the sliding doors to our balcony need upgrading. We would definitely stay here again. Would have been 5 stars but the room size & decor let it down. Location wise it couldn't be better, out the back gate, across the road and your pretty much at the marina. We were b&b which was good, can't comment on other meals as we ate out every night. Staff were friendly and helpful. Pool area I imagine could be crowded high season, other than needing updated we enjoyed our stay. the hotel was lovely and clean,i would recommend it top my friends.the only complaint I have against the hotel was the breakfast only one chef on duty waiting for eggs and other things.